In this series, we’ve done a review of mathematical notation, with an eye on how each notation helps or hinders student learning. In the prior posts, we started to explore function notation, and played with variations. I’m not done with that topic, but will interrupt that sequence for a post on scientific notation. Each line in the picture represents a number, and one line is different from the next only in where the decimal point is placed. Some of the digits are grayed out. I’m using the grayed-out digits as a short hand for indicating equivalent ways of writing the same value. The number in the top row, for example, is most commonly written as .03412 (at least in the United States; in some countries, writing the 0 before the decimal point is standard – there it would be written as 0.03412), but the common form is not the only one, the number .03412 can be written as .034120 or .0341200 or 0000.03412000 etc. For our purposes here in this post, it is useful to think of the version with all the grayed-out stuff present as the “real” or the “full” version of the number, and think of the version without the grayed-out stuff as the “common” or “abbreviated” version of that same number. It also works to think of the grayed-out digits as “invisible” digits of the number. Looking at these “full” versions, it is accurate to say that one line differs from the next only in the placement of the decimal point. Looking at the “common” versions, it is not quite accurate to say that. From one line to the next, some of the grayed-out digits have to be made solid, or some of the invisible digits have to be made visible. 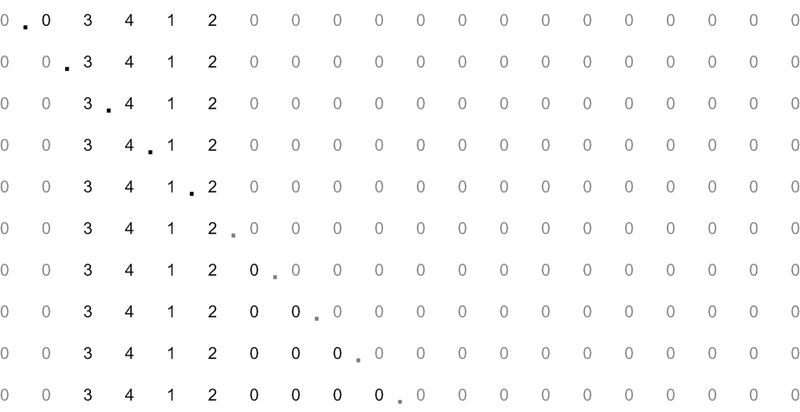 In general, all digits between the left-most non-zero digit and the right-most non-zero digit need to be visible in the standard notation, as well as all the zeros between the decimal point and the rest of the number. In addition, in some countries, at least one digit needs to be shown to the left of the decimal point, and at least one digit needs to be shown to the right of the decimal point, though this does not hold true in the United States. One way to introduce scientific notation is to think of a calculator with a narrow display window. For example, let’s assume, for example’s sake, that the window can only show 5 digits. Calculators that can handle scientific notation are able to represent both larger and smaller numbers in the same 5-digit width, by using an additional symbol, usually “E”, and this “E” symbol is followed by one or more digits. In the picture above, the numbers on the right are as before; on the left we’ve shown the corresponding number in scientific notation. Note that all the numbers on the left fit in the 5 digits our hypothetical window of the calculator is capable of showing us. Let’s look at the number on the left in the last row. Here is one way to read it: “The number I’m showing you (3.412) is not quite the real number, the real number is seven rows lower.” And if you start from the highlighted number on the right, 3.412, and go down seven rows, you get 34120000. Another way of saying this: “The number I’m showing you (3.412) is not quite the real number, the real number has the decimal point moved seven places to the right.” The “E7” construct tells you that the real decimal point is seven places to the right of where it is shown. What the calculator is relying on is that the user can make the necessary adjustment easily and fill in the zeros appropriately. If we now look at the number on the left in the top row, we can read this as follows: “The number I’m showing you (3.412) is not quite the real number, the real number has the decimal point moved 2 places to the left.” The “E-2” construct tells you that the real decimal point is two places to the left of where it is shown. Again, the calculator relies on the user to make these adjustments. I propose that in school settings, teachers freely use the scientific notation as introduced above, consistent with how almost all calculators show it. The essence of this notation is not even that it is able to show very large numbers and very small numbers in a limited space – though that is clearly the motivation for it – but that it shows a number. To see it as a number, all you need to do is accept the new symbol E as part of a number, just like the decimal point is part of a number, and just as commas can make a number more easily scanned, (as in 3,000,000 for three million) – it still is just a number. In contrast, the way scientific notation is often introduced in school textbooks is as an expression: instead of the calculator’s way of showing 3.412E7, the textbook will show . It is true, of course, that when you evaluate this expression you will end up with the same result of 34120000 (or 34,120,000). For students seeing this for the first time, this is unnecessarily confusing. I’ve seen plenty of kids take to their calculator to turn this expression into a single number! (Which, of course, usually doesn’t work in the sense that the calculator will not show the usual form of the result, but give it back in the 3.412E7 format.) And the reverse, to take a number like 34,120,000 and be told to write it as makes even less sense for the students – they already got the answer, why would they want to turn it back into an expression that then needs to be calculated? Many of these students never get that the scientific notation is an alternative way to write the number, and that it was never intended to treat it as an expression to be calculated. In my experience, most of these same students don’t have the same confusion with the calculator format. Since the calculator format (also used in any number of computer languages) is in no way inferior to the standard textbook format, it can be used throughout the classroom. The teacher can simply note that there are people who were taught to write and that it is useful to be aware of this standard, but that it amounts to an old way of writing 3.412E7. This statement is one that students can check on their calculator, if they so choose. In this series, we’ve done a review of mathematical notation, with an eye on how each notation helps or hinders student learning. In the prior posts, we started to explore function notation, which in middle school and high school shows up as , and examined its use. 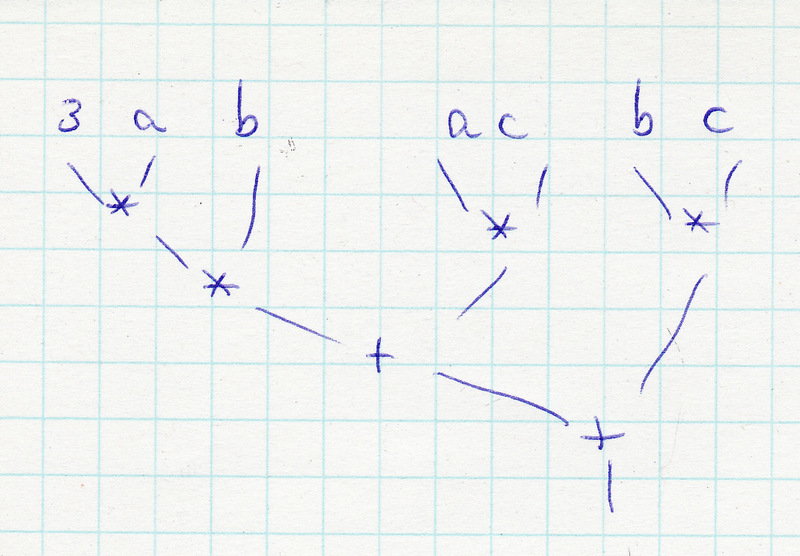 In this post, we will continue the thread of looking for notations that have the power of lambda calculus but are suited to middle school use. Our goal here is to come up with a notational scheme for functions that is suitable for composition and that can gradually morph into the standard notation students will encounter in text books in later grades. This exercise is motivated by the hunch that a light-weight notation for functions could usefully inform the way that expression, equations and variables are viewed and understood. Basic Functions: functions of the kind shown below. These correspond to the basic arithmetic operations from elementary school, in a special way. Adding a number, subtracting a number, multiplying by a certain number, and dividing by a particular number. Polynomials: In standard notation, a polynomial in x may look as follows: . 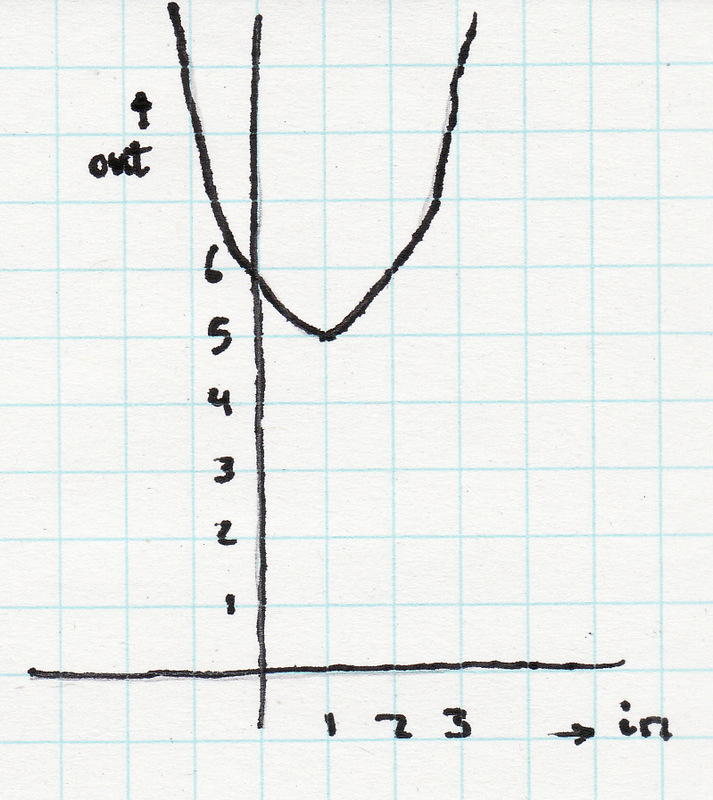 Each of the vertical constructions that feed into the +-bar is one of the terms (nomials) of the polynomial. Each of these terms shares an input, and this input corresponds to the “x” in the standard notation. 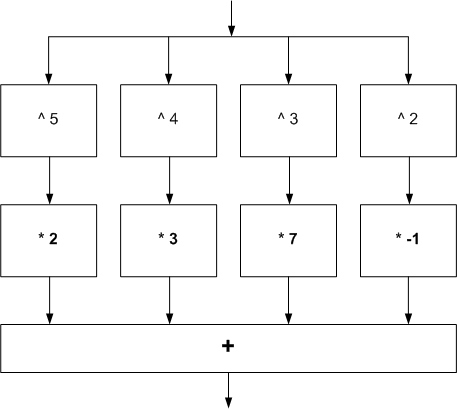 The boxes like ” ^ 5″ show exponentiation, the boxes like ” * 2 ” show multiplication. In this rendition, you see each of the coefficients used as one input into a section of two boxes. This section multiplies and then adds. Each section gets its other inputs from the previous section, and from the input to the entire box. Once you see how this works, you can see that it will work for polynomials of any degree and with any coefficients. There is a patterned-ness to this that, though strange at first, becomes easy and powerful after a while. In this series, we’ve done a review of mathematical notation, with an eye on how each notation helps or hinders student learning. In the previous post, we started to explore function notation, which in middle school and high school shows up as , and examined its use. This post is a continuation of the previous post. and now present it to the world as a single function box with its input at a and its output at c. The new function box is obtained from the two other function boxes by composition. Since we know what the smaller function boxes do, we can figure out specifically what the new function box does. 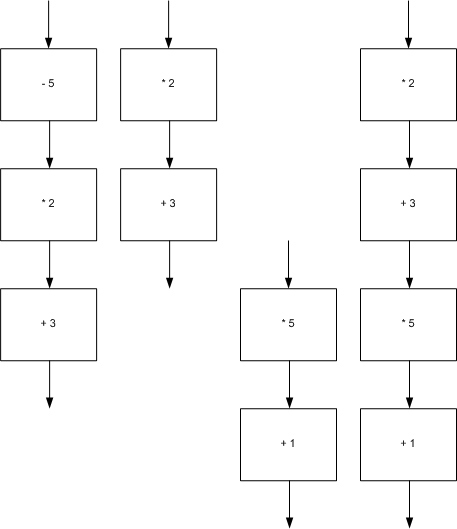 We could try some different numbers at a, and follow them through the boxes at b and then at c. The value 1 at a will result in the value 8 at c. The value 10 at a will result in the value 26 at c. If we collect a whole set of value pairs like this, we can graph them. We would discover that the graph is linear. When we don’t know much about the smaller boxes, we need a different approach. In the picture above, we have two function boxes, labeled and , respectively. Also notice that we’ve labeled the inputs and outputs again, this time as . With regard to the function box , we’d say that x is the input and y is the output. In the standard notation, we write . Similarly, we write . Combining both, we’d get . Yes, in the standard notation, the is shown before the . We should note that in this standard notation, we need to give a name to the value coming in to the function box. The function , in standard usage, is pronounced “ef of ex” ( f of x) rather than plain “ef” (f). This appears to be because in standard notation, the name of the variable x is important; for example, if we say , the name of the variable x shows up again inside of the expression . Let’s look again at the function box labeled “+ 3” above. Notice that it doesn’t contain any variable. Though we might call the number coming in “x” (or “a” or anything else), the function box doesn’t use “x”. It just says “+ 3”. In contrast, in standard notation, we’d talk about the independent variable and the dependent variable , and would write . It seems like the price we pay for using a “normal” looking expression such as is that we have to commit to the use of a particular variable, here . And yet, a function defined as is the same function in all respects as the function defined as . The notion, so beloved in secondary school, that x is always the independent variable and y is always the dependent variable, this gets in the way completely once we look at functions as things that can be combined (composited) easily. I’m by no means the first one to notice that the “x” in f(x) could just as easily be “y” or “z” or “t”. The development of lambda calculus in the 1930s gave us a careful and precise model for function definition and function invocation, complete with a system of notation. This system of notation, involving the Greek letter lambda (λ) has become standard in certain branches of mathematics and computer science. It makes a clear and precise distinction between bound variables and free variables and elucidate how substitution works, to enough precision so that computers can do it automatically. All the same, I’d say that lambda calculus is overkill for secondary school, even if introduced only for the notation, e.g. . I think there are easier ways to make clear through notational means that the bound variable (also called dummy variable) doesn’t matter. In fact, we’ve already seen examples of it. 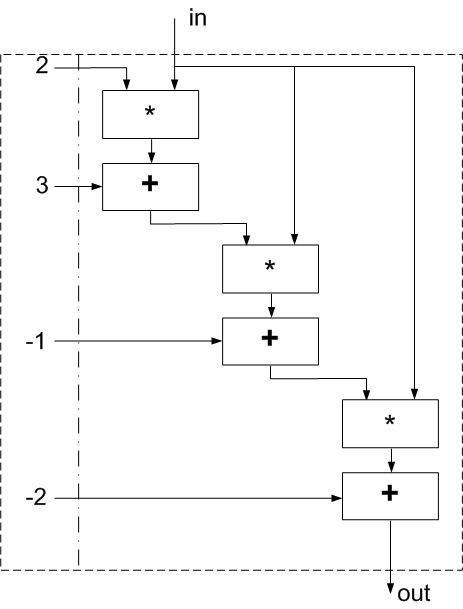 Above are shown five identical function boxes, but with different notation. 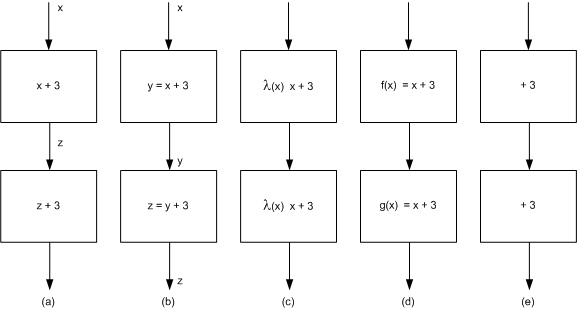 Box (a) shows the action of the box as an expression, x + 3, and labels the input as x. The suggestion is that the “x” in the x + 3 expression matches the number on the input. Box (b) shows the action of the box as an equation, y = x + 3, and labels both input and output, with x and y, respectively. 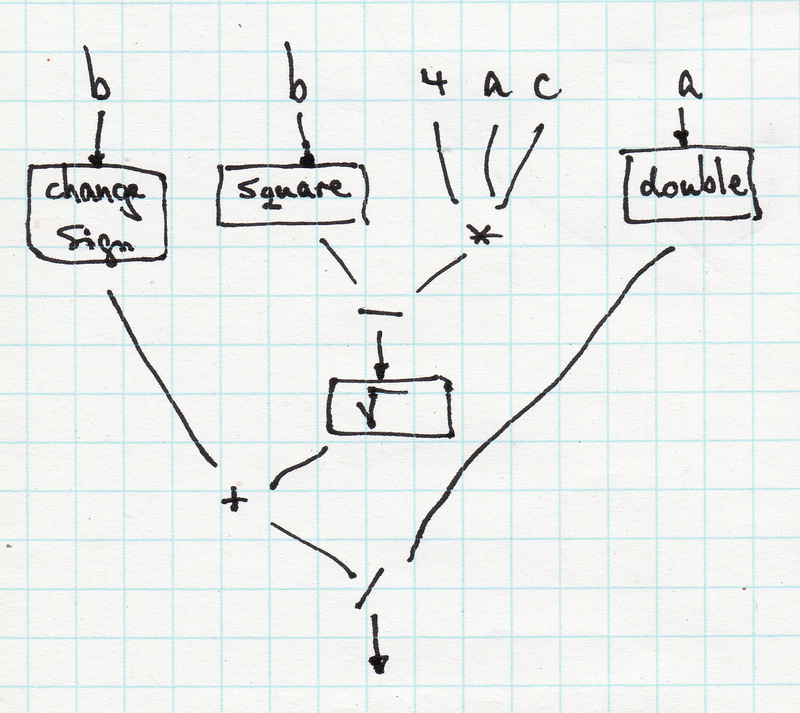 Box (c) shows the action of the box as a function using lambda notation, and the input is not labeled. Here, the suggestion is that the label on the input has no bearing on the notation of the function in the function box. Box (d) shows the function in typical high school notation, using the function label “f” (so the function now has a name, f, even if that name is not used anywhere else.) Box (e) simply says “+ 3”, suggesting that whatever number is on the input gets three added to it. In situation (a), we see that the two identical boxes need to be given different labels, since the number going into the bottom box is not x, is not the same number as the number going into the top box. 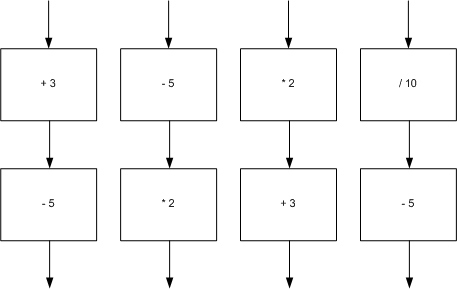 In situation (b), we also need to use different labels for identical boxes, since neither the number going into the bottom box nor the number coming out of the bottom box is the same as those for the box above. In situation (c), we can indeed use the same labels, since the lambda notation doesn’t presume anything about the name or value of the number coming in. In situation (d), we could call both the functions f, but can’t consider both boxes defining instances of the function f. In situation (e), as in (c), we can use the same box with the same label in both places, and have the notation work consistently. So, for my money, the notation used in situation (e) gives us all the power and grace of the lambda notation while being much simpler for use at the middle school level. None of the more traditional school notations for functions has the same power and grace once we start to use functions in composition. My experience with students at the middle school level suggests that the boxes and situations (e) give no problems. However, we need to examine this approach with examples other than adding constants to get a good feel for how expressive this notation really is. This will be the subject of our next post. In this series, we’ve done a review of mathematical notation, with an eye on how each notation helps or hinders student learning. The focus here is on what teachers can do, even if their textbook sticks to the standard notation, to help disambiguate the standard notation for students. In the previous post, I reviewed the standard notation for expressions; in this post I’ll review common variations. In future posts, I’ll look at less familiar – but powerful – notations for expressions. Exponentiation: one commonly seen alternative for the raised exponent shown in a smaller font is a version of the up-arrow. In the top left, we see the standard notation of x raised to the nth power. In the top middle, we see the up-arrow (↑) used as a way to suggest the n should be raised. The up-arrow was available on specialized keyboards in the past, but keyboards for laptops etc don’t tend to have this character. People have used the caret character (^) as a keyboard substitute for the up-arrow, and by extension, for the exponentiation. Several computer languages do this very thing. There is an obvious advantage for being able to put an expression as a linear sequence using a standard keyboard, but that advantage comes with its own disadvantage. The bottom row of examples indicates this. On the bottom left, we see x raised to the power n-1. 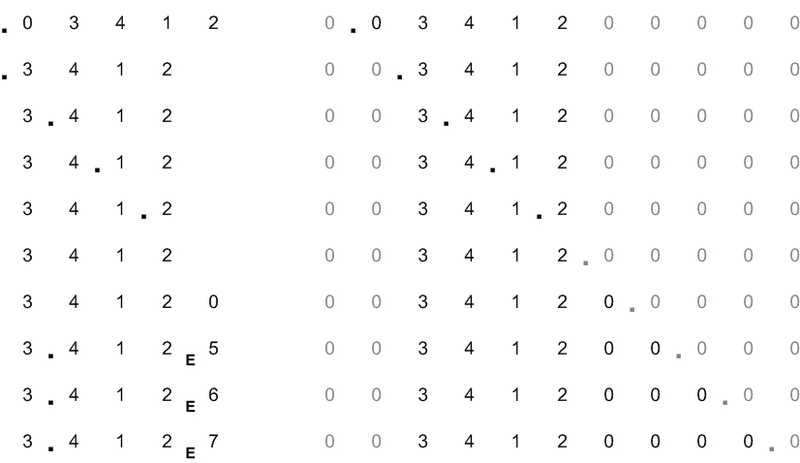 No parentheses are needed to express this grouping: the entire n-1 is rendered in small font and raised. To get the same effect, the bottom middle expression puts the n-1 in parentheses, and so does the bottom right. On top are the square root symbols with the long horizontal bar, on the bottom you see a square root symbol without a horizontal bar (√) available on some keyboards. On the left, where it shows square root of n, both the symbol with the horizontal bar and the symbol without will do fine. In the middle, where we show square root of n-1, the symbol with the horizontal bar indicates the grouping clearly and effortlessly, whereas the √ symbol requires parentheses to make the scope of the square root clear. On the right, we’ve shown a variant that’s easy to produce on the keyboard but requires both parentheses and a dedicated name, “sqrt” for square root. 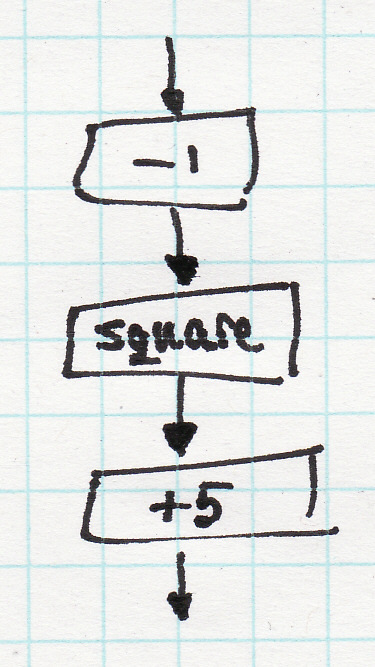 The “sqrt” designation is common in computer languages and is seen elsewhere as well; obviously this notation doesn’t generalize easily for third roots etc., but then neither do the variants based on the √ symbol. I get the impression that there is little demand for special symbols for third roots, n-th roots, etc., since these roots can all be rewritten as exponentiations with fractional exponents. The ÷ symbol for division, as shown on the left, is very common in the early grades, yet rarely used past elementary grades. This, in itself, is a pretty good indicator that it is quite possible to introduce notations for lower grades that are gradually phased out without in any way damaging a student’s eventual understanding or skill or fluency. However, though rarely used by adults, adults do almost universally recognize the ÷ symbol, and this makes it suitable for use on calculators. Most calculators, by far, use ÷ to mark their division key. The symbol seen in the middle, the slash (/), is also universally recognized as a division; on the bottom we see the case where parentheses are necessary. On the right we see a horizontal line used as the dividing line between top and bottom (here known as numerator and denominator). In neither the top nor the bottom situation are parentheses needed. The horizontal line is often pronounced as “over”. So it is n over 2, or n over n-1. This horizontal line seems like it would be very confusing with the line used for fractions. In practice, it is not confusing at all. Many students insist on fractions and divisions being not at all alike, and they pride themselves on being able to tell them apart. For them, “two fifth” is one thing, and “2 0ver 5” is something else altogether. From my perspective, the more kids see a fraction as a division, the better off they’ll be. 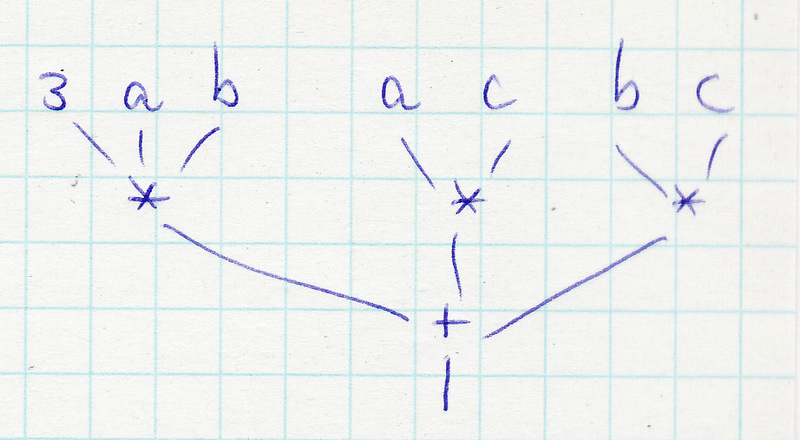 Here is an example, I think, of a notation that is trying very hard to suggest that fractions and division are very closely related – and failing! 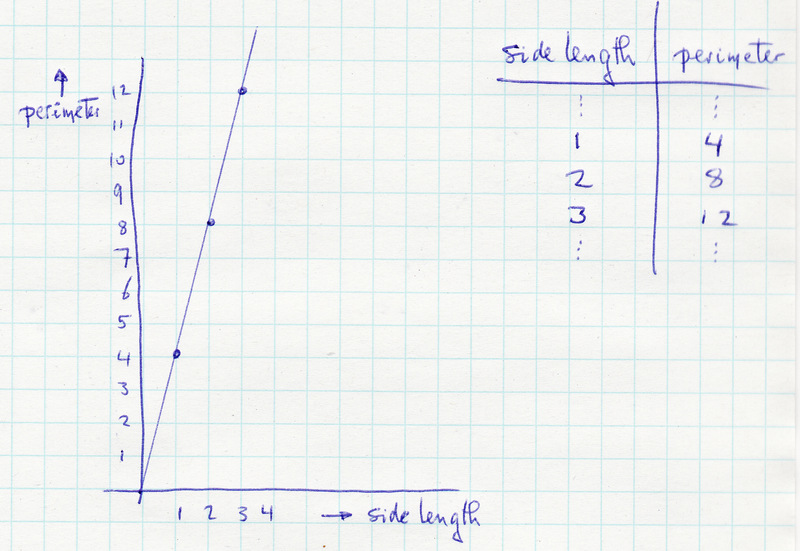 Note: In this account of notations for division, I’m deliberately leaving out notations for divisibility, e.g. 5|30 (read: “5 divides into 30”, or “5 is a factor of 30”) and I’m also deliberately leaving out the symbol seen in the long division algorithm. I’m also leaving out complications having to do with division (in the lower grades) resulting in a quotient and a remainder. In this series, I’ve been exploring issues of mathematical notation and their impact on student learning in school. In the last installment I veered a bit from the straight path and showed a way to denote negative numbers that is very familiar in computer science and yet completely missing from school math. In this post, I’ll get back to the center of mathematical notation in middle school: expressions and formulas. Before embarking on various alternative notations in subsequent posts, let me use this post to review the standard notation and all that it implies. First, a clarification on terminology. In an equation like , we call an expression. And as far as I can tell, formula is just a synonym for expression; other people claim that a formula is the kind of thing like F = C*9/5 + 32 where you convert from degrees Centigrade to degrees Fahrenheit by applying a recipe written in mathematical language – I’ll stay neutral on the issue here. Beyond middle school, the whole equation might be seen as an expression, in this case one with a value of true or false. The use of “=” as an operator, with possible values true or false, is one I deliberately skipped in my earlier posts about the overloading of the equals sign. In middle school, we know what expressions consist of, since we’ve all learned the Please Excuse My Dear Aunt Sally thing about the order of operations. By implication, we’re looking at the composition of exponentiation, multiplication, division, addition and subtraction, where composition is done by use of parentheses. And this pretty much matches what students see in middle school, with only the occasional absolute value |x|, square root √x or trigonometry functions sin(x), cos(x) and tan(x) adding a wrinkle. Since in the standard order of operations the last action we do is add or subtract, we can coin a name for those things that we add or subtract. Actually, there is an already existing name that will do fine, it is called a term. So an expression is either a term or it is the sum or difference of terms. According to the order of operations, what comes before additions and subtractions is multiplication or division. This means that these terms, these things we are adding or subtracting, are themselves products or divisions. The things we are multiplying or dividing, the are commonly called factors. So a term, in turn, is either a factor, or a product or division of factors. A factor, in turn, is either a primary, or a primary raised to an expression. Finally, a primary is either a number, or a variable, or a parenthesized expression. The little grammar above assumes that it is clear what a number looks like, and what a variable looks like. This grammar can be extended to deal with roots, absolute value and trig functions by adding rules for primary, e.g. These rules together make for a language of expressions that can be uniquely parsed; under broad circumstances, the ×symbol can be omitted and expressions can still be uniquely parsed. This language is compact and terse; it is fairly easy to appreciate why this language won out among professionals and spread throughout the world. Yet just because it is compact and can be parsed uniquely doesn’t mean that it is easy to interpret by student learners. In earlier posts I’ve alluded to the confusion students have between parentheses and multiplication: students see parentheses, and are primed to expect that there is a multiplication involved. Sometimes there is, as in , and sometimes there is not, as in , and yet I’ve routinely seen even ‘good’ students treat as some kind of multiplication. The standard method of writing expressions is linear and monochrome. We can do better in a learning environment, and subsequent posts will explore various alternatives.